In an infamous Twitter meme that misquotes Alan Moore’s Watchmen, Dr. Manhattan, naked, blue, and seated in a crater alone on Mars, says: “I am tired of Earth. These people. I am tired of being caught in the tangle of their lives.” He’s a perfect candidate for Windows 10 Mixed Reality, Microsoft approach to virtual reality, that, starting today, is compatible with SteamVR. Players start off in Cliff House, available since the Fall Creator’s Update, a barren sort of space-purgatory that lets you access the Microsoft Store, open webpages, watch movies and even “decorate” with holograms, which are basically 3D gifs. It’s cute, but mostly you summon and interact with 2D windows, playing with a few Microsoft demos and engage with two story tall browser windows. It feels like a waiting room before SteamVR proper, which you can already use in the Oculus and HTC Vive ecosystems. Microsoft’s “Mixed Reality” plan seems to be: double down on well known IP like Halo and Minecraft, integrate the Steam VR ecosystem, and introduce less expensive headsets that don’t require extensive setup (you don’t have to mount stations on the floor, and most of what I saw played perfectly fine while seated). VR as a whole isn’t landing with consumers and this latest stab feels iterative. It’s off to a slow start to say the least. As a lifelong console devotee, VR still feels like a low stakes chemistry experiment to me. Sometimes the games succeed, but, as a medium, it’s yet to consistently replicate the same result. Microsoft doesn’t radically alter the formula, and thus, the results are disappointingly similar to other forays into VR: mixed. Steam’s VR Hub is much smaller and better executed. 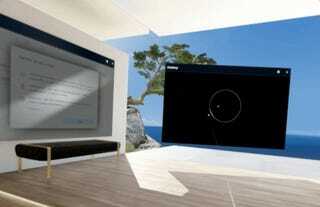 Immersive to the point of feeling isolating, Microsoft’s take on virtual reality begins in a home base (Cliff House) floating through space with interactive objects. To interact with the virtual world you have three devices: The headset and dual controllers that basically look like the Vive controllers except with satellite-shaped circles attached to the head. There are no extra boxes to set up around the room. Put on the headset and it uses two cameras on the front to sort out where you exist in three dimensions. It also visually monitors the controllers. Consequently the tracking for the controllers is perfect, and they grip and rest easily in my hands. The headset is comfortable, but requires separate headphones to really complete the experience. (You’ll soon forget you’re wearing them, knocking against them when you go to take off your headset). Steam VR’s hub is much better than Microsoft’s. The Cliff House is cool, but Steam VR is its own nervous system, replete with an enormous catalog of VR games and still serves as the main reason for most people to get into VR. And in that regard, not altering the formula works perfectly—the Steam VR room is smaller, but lets you look at screenshots from friends, see what your friends are playing, and, via Mii-style avatars, you can visit your friends’ rooms. It’s the only part of the experience that didn’t feel lonely ,and the familiar design—Steam’s signature blacks, greys, and multimodal boxes in every window—feels like a natural extension of the VR experience, not as alien or remote as Cliff House. 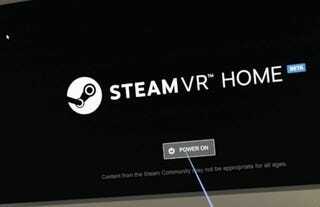 Bizarrely, there’s no easy way to launch Steam VR games within Cliff House. Though Halo and a few of the other Microsoft titles launch via objects in the virtual world that serve as shortcuts (Master Chief’s helmet starts the game, for example) the only way to launch most Steam VR titles is simply bringing up the Desktop window within the hub and opening Steam. It’s not a fatal error, but begs the question why anyone would use the hub at all instead of launching games from Steam VR itself. Opening up games via the desktop is a bizarre kind of art. Luckily, the games themselves don’t suffer, even if the overall presentation isn’t very thoughtful. Superhot VR, a hyper-stylized take on the slow-mo fight sequences from The Matrix, plays perfectly. Grabbing weapons in slow mo, disarming enemies, punching and diving all happened seamlessly. Contrasting that, The Hospital: Allison’s Diary is a moody horror game in which you play as a journalist trapped in a haunted hospital. It didn’t play at all. The controller turned into a flashlight, letting me scan the opening area, but couldn’t pick up on the joystick’s movement. I was stuck in the opening area. Steam VR’s games are still on the cheaper side, but imagine the horror of picking up the headset, waiting and waiting for proper Steam integration, then spending $30 to $40 on a game for it not to work. Not every Steam VR game works right out the box, however, and Microsoft has emphasized this as a “public beta” with an official release coming later. The games themselves don’t suffer for a lack of polish, but if Microsoft wants to convince me that Steam VR is naturally integrated with its Mixed Reality ecosystem, it has a lot of work to do. 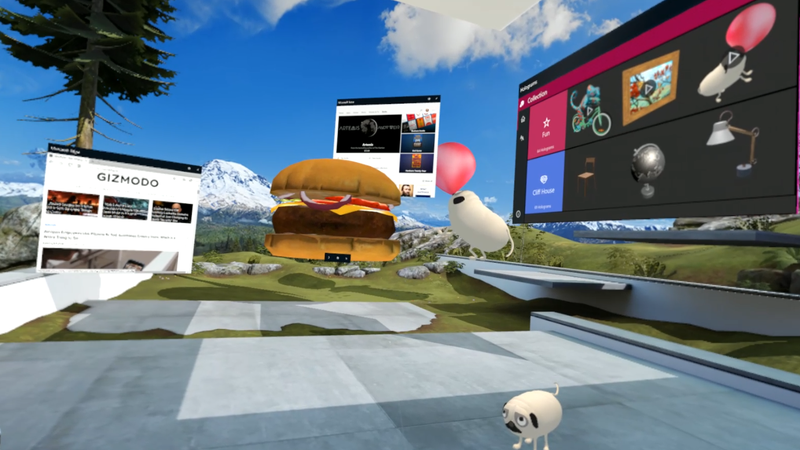 It’s good that the Mixed Reality set feels like the beginning of a new breakthrough, but, unfortunately, a “beginning” is all it offers, not a complete experience.